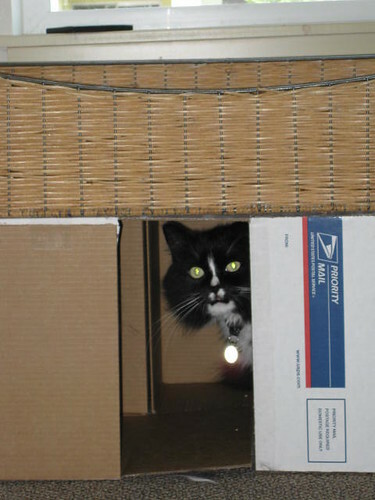 Midnightsky Fibers: Improvising a cat house! 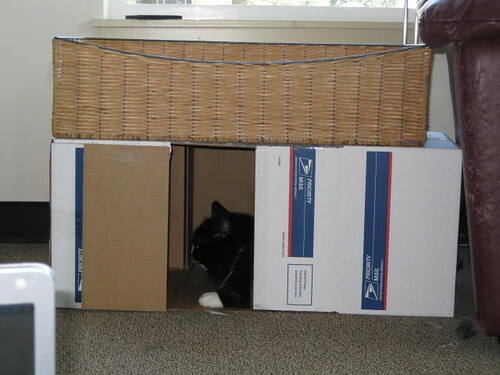 I had a bunch of used priority mail boxes sitting around that were all the same size, so presto- almost instant cat house! I taped the flaps together so the boxes would stay in place. There are 3 boxes- 2 on each "side" and one towards the back. 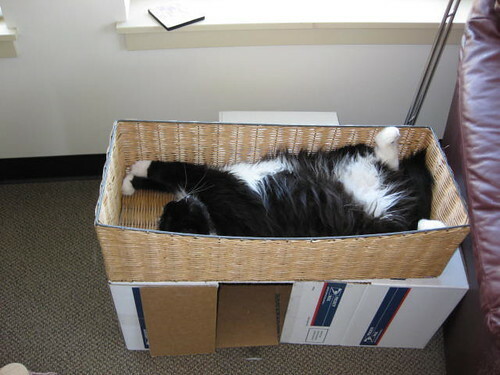 The basket isn't on top right now- I use it for yarn many days, but the cat still likes it just fine. That is, when he is not trying to sleep on my head at night! I am considering instituting a no cat in the bedroom policy since he makes the bed so fuzzy, and him sleeping on my head doesn't help the allergies. Every time I try and close him out he scratches on the door- he can open it to unless you have something against it to stop him!